Android Auto will be available straight from Android phones soon and with it, popular navigation app Waze. Android Auto, Google's in-car interface, will soon be available to download as an app. This means you won't have to buy a new car or an expensive head unit to use it. In other words, access to Android Auto will no longer cost you hundreds to thousands of dollars. Android Auto will be tweaked for phones, with a slightly different interface for smaller screens. The interface will look basically like Android Auto in the dashboard but with big, easy to press buttons for use on a smaller screen. 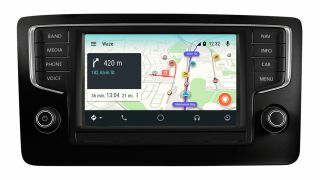 Waze will also be coming to Android Auto, an app which was missing from the beginning. Users will no longer be forced to only use Google Maps, but instead have a choice of one of two Google apps. The social-bent navigator has been a popular app for drivers with features like accident and police reporting, superior traffic rerouting and chat. Oh, and you can have T-Pain navigate you, too. Additionally, Android Auto will work wirelessly in some compatible cars. This means you won't need to plug in your phone in order to power a car's head unit. Just be aware that using Android Auto wirelessly will drain your battery since your phone isn't being charged via cable. However, cars with wireless charging pads built in will solve this issue. Google is also adding 13 new features in Android N that'll allow automakers to embed full, native Android into dashboards and control a vehicle's systems like heat and diagnostics.